Clark also said that he would have liked to have attended December’s Snowball Derby, but elected not to make that trip for the same reasons. major open Modified shows and contending for the Northern Championship in the Race of Champions Modified Series. He also won the annual Race of Champions event at Oswego Speedway (NY) in September. It turns out that PASS champion Johnny Clark will not be racing during Speedfest at USA International Speedway (FL) later this month. Clark had considered going, but made the tough choice to stay home instead to help his 2005 racing program. Eldridge raced the car from 1967 to 1975 and getting it back to the condition that it is now in was quite a challenge. Last year’s SK champion Ted Christopher will be back, along with his brother Mike. Also filing an entry, in the #21 Ray and Chris Jacob-owned machine, is Modified Tour driver Eddie Flemke. Jeff Malave is another Tour regular who will be running at Stafford in a SK Modified this season. 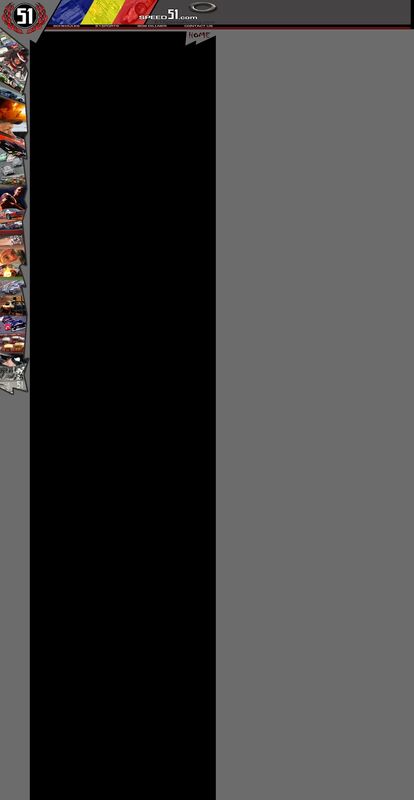 A look at the Modified Tour schedule shows that any driver who plans on running full seasons in both cars might have a few tight days, but no direct conflicts. The biggest challenge will be racing on New Hampshire International Speedway on two Friday afternoons in July and September and then hightailing it down to Connecticut for the Friday night features. The SK Modified division at the Stafford Motor Speedway is shaping up to be the place to race in 2005. NASCAR Whelen Modified Tour driver Donny Lia was announced this week as the new driver for the #47 Wisk-Clorox car in the division. Last season, Chuck Hossfeld started out the season in that ride, with Steve Chowansky taking over later in the year and scoring two victories. One of the busiest Modified racers in 2004, Eric Beers, has picked up a ride for probably the most legendary team in NASCAR Whelen Modified Tour competition – the Boehler Racing Enterprises #3. 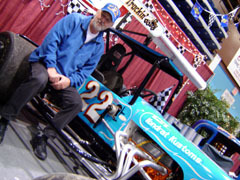 The blue BRE #3 has been a fixture in Modifieds for over 40 years. The team first won a Modified championship in 1967 and has backed up that fete a total of six times. Ole’ Blue was most recently driven by Jerry Marquis, who drove it to victory lane at Riverhead Speedway (NY) and Stafford Motor Speedway (CT). Some of the legendary drivers who have wheeled the car through the years include Bugsy Stevens, Fred DeSarro, Leo Cleary, Ron Bouchard, Ken Bouchard, Wayne Anderson, Tony Hirschman and Tom Cravenho. his decision to be smart and watch the bottom line instead of heading to Florida to race doesn’t come as a surprise. When Speed51.com recently caught up with him at the Northeast Motorsports Expo in Augusta, Maine, we had to wait briefly while Clark got called away on a wrecker call for his family’s automotive business. The only two official PASS entries that have been received so far for Speedfest are the SP2 Motorsports entry of Mike Rowe and Maine’s Bill Rodgers. Tucked in among the modern racing machines on display at the Northeast Motorsports Expo was a Supermodified built nearly 45 years ago. A closer look though revealed a few differences – coil-over shocks and large brake rotors were tell-tale signs that Roy Eldridge’s racecar was not quite the way that it was back in 1960. Nevin George and the #0 NASCAR Whelen Modified Tour team of Ralph Solhem have announced that they will return together for 2005. 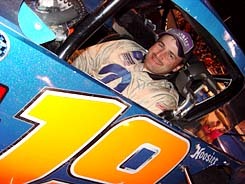 George won at Beech Ridge in 2004 in the #0 and is entering his fourth season in the ride. The NASCAR Busch North Series will make their first stand alone trip down south on August 20th with a stop at the Motor Mile Speedway (VA). The 150-lap race is scheduled for a Saturday night and will come one week before the series stops at Oxford Plains Speedway (ME). A date at Myrtle Beach Speedway on Labor Day weekend is also expected to be announced shortly, bringing to two the number of Busch North events south of the Mason Dixon Line in 2005. In the late 1980’s and early 1990’s, Busch North competitors were given points for entering “Combination Races” with the NASCAR Busch Series at tracks such as Daytona, Rockingham and Richmond. However, this will be the first time in series history to travel to a track further south than Dover, Delaware for a regular season points event. Donny Lia is just one of several Modified Tour drivers double dipping at Stafford this year. The current Busch North champion, Andy Santerre already lives down in North Carolina and will spend 2005 as the Team Manager, and possible part-time driver, for the newly-relocated Grizco Racing team of Mike Stefanik and Brad Leighton. This past weekend, Santerre gave hockey fans in Charlotte a taste of Northeastern racing by appearing at the Charlotte Checkers NASCAR Night to meet fans and sign autographs. Also representing the North at the event was NASCAR Modified Tour driver Donny Lia, who most recent trip to North Carolina had been November’s North vs. South Shootout, which he won. The event helped to raise money for charity and also featured Sterling Marlin, David Stremme, Todd Kluever, Jason Hogan, Southern Modified driver Johnny Sutton, Jeff Fultz, Speed Channel’s Bob Dillner and several other drivers. The last two Oxford Plains Speedway (ME) track champions have teamed up for the 2005 season in an effort to try and collect even more hardware. Scott Robbins, the 2004 Pro Stock champion, will cut back to a limited schedule and help 2003 champion Ricky Rolfe by lending him his sponsor, RoweAuburn.com . The two drivers will also be teammates in the events that Robbins does enter. 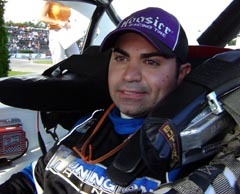 Robbins, who won the 2003 Oxford 250, hopes to repeat that fete this season and will run events leading up to July’s big races as a tune-up for the 250. In other Oxford Pro Stock news, Mike Rowe plans to show up for multiple Saturday night shows leading up to the Banknorth 250 with his SP2 PASS team when they have an occasional off weekend from touring. 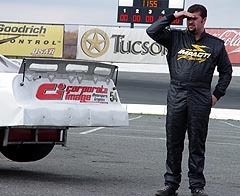 ACT Late Model and Thunder Road Speedbowl promoter and co-owner Tom Curley has been named as the Racing Promotion Monthly (RPM) “Regional Promoter of the Year” for 2004. He will also be one of eight promoters eligible for the 29th annual “RPM Auto Racing Promoter of the Year” award. The award is determined by the votes of over 1,000 members and will be presented in Florida during Speedweeks in February. Curley has been nominated for the award three times in his career. It used to be that pre-teen kids would go to the track and sit in the stands. This season, at Jennerstown Speedway (PA), they will be able to race in two entry level divisions. The track has lowered their minimum age requirement in the Legacy and Hobby Stock classes to 12. Track officials said that the move was to allow a growing number of talented kart racers to have a place to move up. Minimum ages in all other classes, including the Super Late Models, will remain at 16. One of Speed51’s other favorite websites has picked up a sponsor to support itself in 2005. ModSeriesScene.com, founded by the late Lou Cady, announced this week that Precision Automotive will back their website during the coming season. Speed 51 contributor Howie Hodge, along with Aime Campbell, have maintained the site since Cady’s death last year.